In aNewSpring most courses consist of many content parts. There are two ways to add them and a variety of options to fill the content. This article explains how to add content parts and how to edit them using the plus-editor. There are two different ways to add content parts. Either via the template or by adding content parts in the content library. This is only possible when you have the Author and the Designer roles. Go to the tab Courses and choose the template you intend to add content parts to. Click on Edit you will be directed to the template of your choosing. Click on Edit next to the activity to make the changes or to choose the content you want to use. When at the tab Activity content, you can insert the content part you intend to use by clicking +Content Part. This is only possible when you have the Author role. In the tab Content click on Manage and you will get to the Pages tab. Click +Content part to add a new content part. 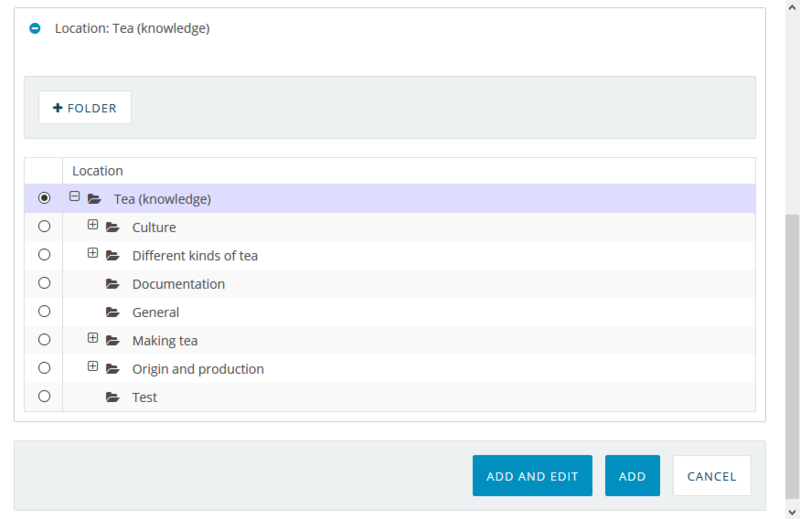 Type the title you want to use for this content part, press enter to give this content part an ID (optional, this makes it easier for you to find the content part when setting up the course). Choose the layout you intend to use. Click on Location to put the question in a specific folder. Click Add and edit to save and start filling the content part. To start editing, click on the + to add content to the box. Determine the content type you want to use. Also read the article: 'What content part type should I choose?'. Click on the + to add new rows and columns to your canvas. You can split each box vertically to add a column and split the square horizontally to add a row. Canvas is the screen on which the content is shown. You can determine the size of your canvas with the slide switch. 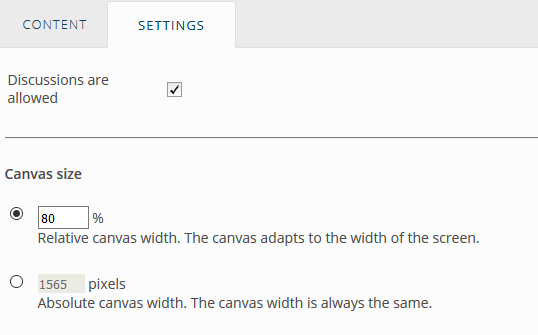 Click on the Gear or the tab Settings to set the canvas settings on Relative or Absolute. Click Update to save. 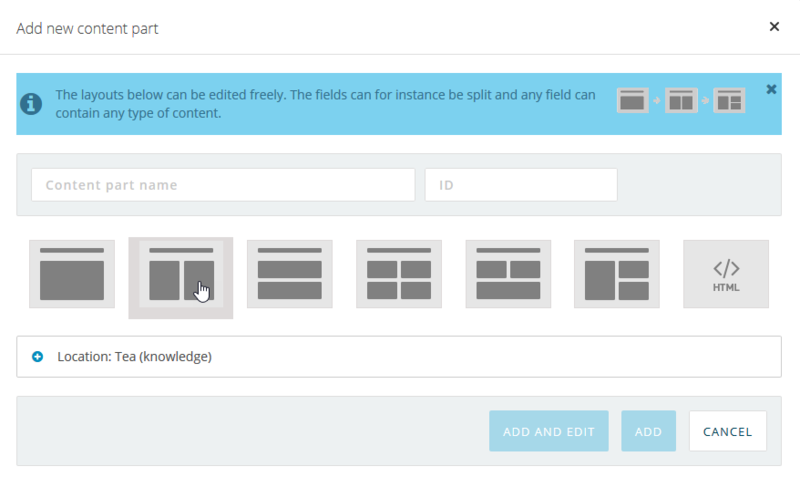 Click at the splitbutton Update and new to save and create a new content part. Click at the breadcrumb Manage content to go back to the content library. 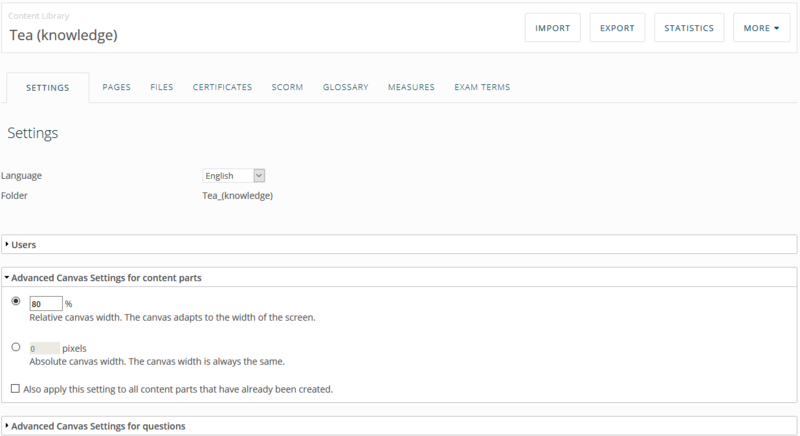 At the tab Settings you can change your canvas settings for questions and content parts all at once.